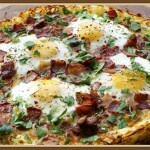 Potato Crusted Breakfast Pizza - What the "Forks" for Dinner? Sunday morning breakfast at the Boyd’s…………Pizza????? Pizza you say……..not the kind that is cold and left over from the night before, but a hot from the oven breakfast pizza. 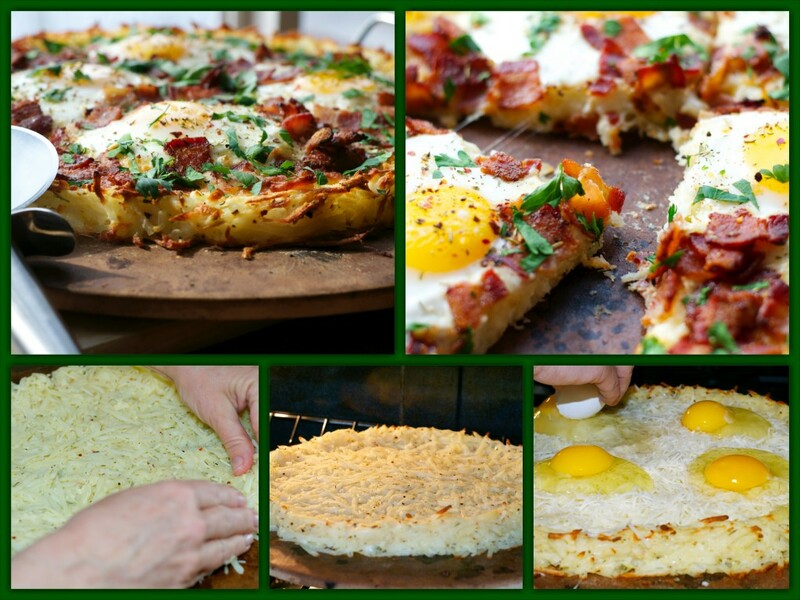 Potato Crusted Breakfast Pizza! It’s everything from breakfast formed into a pizza. Hash browns (crust), topped with eggs, bacon, and cheese. 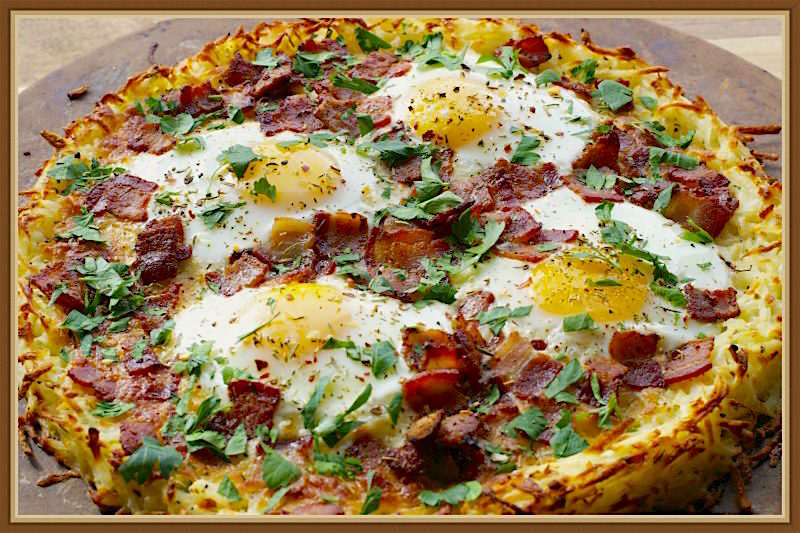 I have seen recipes for breakfast pizza before, but always on a bread type crust………….. I guess that is like toast? But I liked the idea of crispy hash browns, with a nice egg on top, and smokey bacon. The cheese is just an added bonus, after all who doesn’t like cheese. Tim put salsa on his, I’m that ketchup on eggs crazy person, so that was my choice, but we both tasted pre-condiment and it was great. So, whatever your condiment choice, Potato Crusted Breakfast Pizza is a nice change of pace for your Sunday breakfast. In a large bowl mix the hash browns, 1 egg, 1/2 cup cheese and 1 teaspoon Italian seasoning until well blended. On a pizza stone or cookie sheet sprayed with non-stick spray shape the potato mixture into a circle making a lip around the outside edge to form your crust. Bake crust in preheated oven for 20 minutes. Remove crust and top with 1 1/2 cups Italian cheese, the 4 eggs, cooked bacon and sprinkle with Italian seasoning . Return to the oven for an additional 15 minutes or until the eggs are cooked to your desired donees. 15 minutes makes the eggs over medium. remove from the oven and sprinkle with chopped parsley and cut into wedges to serve. You may add more eggs depending on the number you wish to serve.